HMH Books for Young Readers, 9780618439072, 208pp. 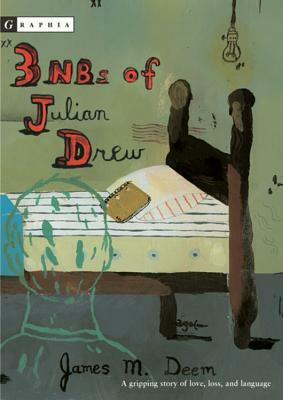 Julian Drew “lives” with his father, his abusive stepmother and her children, but it’s not a life anyone would want. He buys his first NB on October 25 at Osco Drug in Tucson. Green spiral. 80 pages. 34 lines per page. He tries to write but his pen won’t cooperate. Then he develops a secret code. Mysterious notebooks record his fight for survival and recovery. Gripping and poignant, this story will hook readers from the first page. James M. Deem is the author of numerous books for young readers, including 3 NB of Julian Drew, Bodies from the Ice: Melting Glaciers and the Rediscovery of the Past, and Faces From the Past. Mr. Deem lives outside of Phoenix, Arizona.